How's everyone's week going so far? It seems like my work week has finally slowed down some. I get to be in the office more often and finally catch up with hundreds of emails from last week and send out the reports from last two weeks' site visits. Since I have an actually hour for lunch (yay), I decided to finally review my Lise Watier Portfolio Corrector which I refer to as concealer wheel in my FOTD's. I've been using it since late September so I feel that now I can give it a fair review. 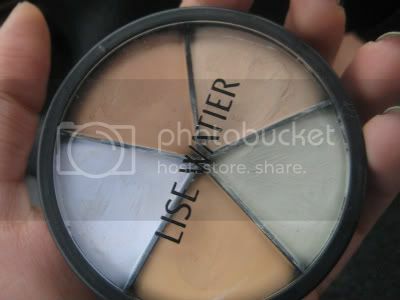 As per Lise Watier's website: "A five way concealer spectrum designed to correct and conceal skintone irregularities and under-eye circles. The soothing properties of chamomile and Vitamin E and C provide Skin smoothness and comfort". There are currently two wheels available. The one I have which is for light skin (which I assume anyone under NC40 should be able to use) and now they have a new wheel for dark skin. All of these colours can be used separatley or mixed together based on your skintone and needs. I use the green on its own on my red spots and small scars, a mix of ivory and yellow beige under my eyes (I don't do this often asI don't have undereye circles), lilac to highlight my nose and brown to sculpt. I actually don't use the brown that much since I prefer to sculpt with a powder as it's faster. I have used it for more detailed looks though and was pleased with the result. I also used the brown on my mother in law's dark spots - she's about an NC42- when I was doing her makeup and it worked great. There's quite a lot of product in this corrector, 25 g to be exact. I don't seem to have put a dent in it since I started using it and I have been using it everyday. I even caked the lilac and ivory on my face for my Edward Scissorhand Halloween look. I would say this is the most perfect all-in-one concealer I've come across. It does a great job of hiding impefection though learning to work with it takes some experimenting. The formula is a little dry and takes some getting used to but once you get the hang of it, it's perfection. What I do is that I take some more concealer for a spot that I think I need with my brush, place it on and blend slightly, then use my fingers to blend it entirely into my skin. As I mentioned the formula is a little dry, ensure that you moisturize the skin before you apply this. On the upside, I find that the dryness nature of this concealer makes for a longer lasting effect. Costwise, I paid about $29 CAD for this and I feel like that's a fair price for the amount of product you get and the functionality/performance. I definitely recommend this to anyone interested in an amazing concealer. You can purchase Portfolio Corrector from Shoppers, the Bay and Lise Watier website. 3 Responses to "Lise Watier Portfolio Corrector Review"
This is neat, and seems a lot more affordable than what I normally see. Thanks for the review! I have very good price. It's Finally Weekend -> Time for Glitter! Nail Polish Haul Makes Any Day a Better Day!